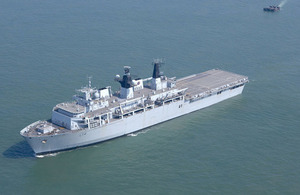 A number of Royal Navy ships will take part in Baltic Protector, including HMS Albion. Crown Copyright. As Britain prepares to leave the EU, our unwavering commitment to European security and stability is more important than ever. Deploying our world class sailors and marines to the Baltic Sea, alongside our international allies, firmly underlines Britain’s leading role in Europe. It is a huge privilege to command the Baltic Protector deployment, and I am greatly looking forward to working with our close friends and partners from the other eight Joint Expeditionary Force partner nations. Together, this UK-led Maritime Task Group will conduct a series of demanding amphibious exercises and maritime security patrols across the Baltic Sea that will serve to improve the way we operate together and our readiness to respond to crisis.